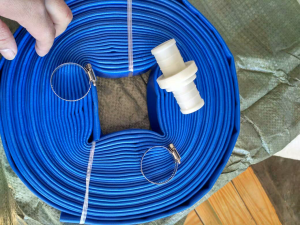 Home›Blog›What is the technique of winding up PVC lay flat hose? What is the technique of winding up PVC lay flat hose? 1. After using PVC lay flat hose, wash immediately. The lining PVC lay flat hose needs hanging. The coils are stored in a cool and dry place. If small openings are found when using agricultural lining, please wrap them up and knit or repair them as soon as possible. If there is obvious damage, it should be replaced immediately. 2. When laying the agricultural sprinkler fire extinguishing belt, if it is necessary to pass through the railway, it should pass under the track to avoid unnecessary traffic accident risk. 3. When using PVC lay flat hose, avoid wrinkling and dead bending, and minimize the pressure of PVC lay flat hose in the working process. The previous article：What are the reasons for the unsuccessful assembly of PVC lay flat hose? The next article：How is micro-irrigation of PVC lay flat hose carried out?